Nanoparticles, and liposomes in particular, have been used for drug delivery in cancer and inflammatory disease therapies for several years, but traditional manufacturing methods are labor intensive, hard to reproduce, and difficult to scale up. Because the characteristics of nanoparticles are sensitive to manufacturing conditions, precise and reproducible control of the manufacturing process is necessary to ensure consistent particle characteristics at different scales of production. Precision NanoSystems Inc., based in Vancouver, Canada, has developed a proprietary technology – the NanoAssemblr™ platform – for the rapid development of nanoparticles and seamless scale-up for clinical studies and commercial production. 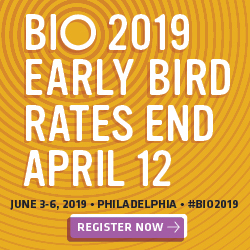 This technology is transforming the development and manufacturing of a range of nanoparticle formulations from a hit-and-miss affair to a standardized process, accelerating novel nanomedicines from the bench to the clinic. Nanoparticles comprised of polymers or lipids can be used to encapsulate biological or small molecule active pharmaceutical ingredients (APIs) for drug delivery. A major advantage of this approach is that it protects the API from harsh extracellular environmental conditions in vivo, allowing delivery of the intact API into the target tissues, cells, and sub-cellular compartments. Lipid-based or polymeric nanoparticles are generally formed by nanoprecipitation, in which the nanoparticle components are dissolved in a water-miscible solvent, then mixed with an aqueous buffer. The resulting changes in the polarity cause the nanoparticle components to self-assemble. A variety of APIs can be added to the formulation for encapsulation during particle self-assembly, or loaded into preformed particles. A wide range of parameters – including the mixing mechanism, temperature, pH, nanoparticle composition, and shear forces – affect the self-assembly process, and further processing steps, such as sonication, homogenization, or membrane extrusion, are required to ensure consistent sizing across the particle population. These additional processing steps are labor intensive, suffer from poor batch-to-batch reproducibility, and are difficult to scale. This not only affects the efficacy of nanoparticles as drug delivery vehicles – particle size has a significant impact on particle biodistribution – it also makes it difficult to compare results, establish trends, or apply rational design principles during development. Researchers developing nanoparticles for drug delivery applications, therefore, all face the same challenges: developing a potent formulation, meeting the reproducibility criteria of regulatory authorities, and achieving reliable scale-up for further testing. The shortcomings of nanoparticle production techniques created a clear demand for flexible and controlled mixing processes to enable consistent nanomedicine production. Precision NanoSystems was founded in November 2010 to address this need. A spin-out from the University of British Columbia in Vancouver, the company brought together a multi-disciplinary team of engineers, chemists, pharmacists, biophysicists, and molecular biologists to focus on solving the problem of manufacturing nanoparticles for drug delivery. The team’s first step was to use its many years of combined experience in drug discovery and development to identify the specific needs of a nanoparticle production technology for the pharmaceutical market. Rapid and reproducible particle manufacturing was obviously a key requirement, to meet the joint pressures of short development timelines and ever-increasing regulatory considerations. Next on the list was flexibility, offering the capacity to alter individual processing parameters to allow particle optimization for a wide range of applications. Seamless scale-up was also essential, allowing straightforward transfer of drug candidates from benchtop proof-of-concept studies to large batch production for clinical trials and commercial production. It was this last consideration that proved pivotal in technology selection, as it was already widely understood that simply increasing the size of reaction vessels for large-scale production radically changes the underlying fluid dynamics, leading to large variations between batches and reaction volumes. Precision NanoSystems used its expertise in nanoprecipitation, microfluidics, instrument design, and drug manufacturing to develop the NanoAssemblr platform, a cartridge-based microfluidic mixing system designed to offer stringent control of both the chemical and physical environment for reliable and reproducible nanoparticle self-assembly. This technology takes advantage of the highly predictable, time-invariant mixing offered by laminar flow to ensure rapid and controlled production of a variety of nanoparticles for the delivery of drugs or biological molecules. The optimized geometry of the cartridges maximizes the interface between the fluid phases, offering carefully controlled mixing in milliseconds in nanoliter reaction volumes. Component mixing occurs faster than nanoparticle self-assembly, preventing sub-optimal mixing and heterogeneous precipitation, and the low energy conditions required are ideal for biologics. This standardization of processing allows the production of nanoparticles with carefully defined characteristics, including chemical compositions, concentrations, and drug/excipient ratios; nanoparticle manufacture is no longer a dark art. Using NanoAssemblr technology, a typical nanomedicine workflow begins with the production of a variety of nanoparticle formulations. The technology allows each formulation to be manufactured in under a minute, excluding any downstream processing required, enabling rapid screening for the desired biological activity. Lead formulations can then be investigated further, using a Design of Experiment (DoE) approach to assess and define the best parameters for robust manufacturing. The flexibility of the technology allows researchers to assess how changes in processing variables – drug and excipient concentrations, flow rates, and mixing ratios – affect the structure and composition of the resulting nanoparticles, including average particle diameter, polydispersity (inhomogeneity) and drug encapsulation efficiency. Parallelization is at the core of the NanoAssemblr technology, allowing throughput to be increased to meet the requirements of each phase of the drug development workflow without changing the reaction conditions. Precision NanoSystems offers four small footprint systems based on the same underlying microfluidic technology to match the various needs of the market. The smallest system in the family – the NanoAssemblr Spark™ – is designed for early stage research and development activities, using disposable microfluidic cartridges to provide controlled and reproducible manufacturing of 25 to 250 μl nanoparticle suspensions in less than 10 seconds. This scale is ideal for screening scarce or expensive APIs and nanoparticle excipients for early formulation development. Measuring just 15 cm2, it fits easily into cell culture hoods, and features a wipe-clean touch screen interface for easy operation and decontamination. 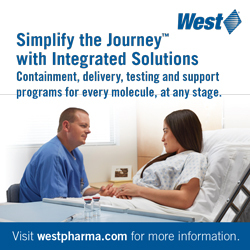 Once screening is complete, the process must be developed and optimized, and the number of different chemistries narrowed down. The NanoAssemblr Benchtop™ – the first system developed by Precision NanoSystems – has the capability to produce from 1 to 15 ml of nanoparticle suspension, and offers enhanced control for formulation and process development. A simple, semi-disposable microfluidic cartridge allows nanoparticle production at flow rates up to 18 ml/min, and most nanoparticle formulations are completed in just 15 to 20 seconds, enabling over 40 formulations to be prepared in 1 day. To conserve scarce materials during formulation development, nanoparticle volumes as little as 1 ml can be formulated for in vitro studies, or up to 15 ml can be manufactured per run for in vivo assessment of biological activity. The NanoAssemblr Blaze™ was designed to seamlessly scale NanoAssemblr Benchtop formulations up to 1 liter. Using the same microfluidic mixer as the NanoAssemblr Benchtop, it employs continuous flow and parallelization to increase volumes and throughput, greatly reducing the need for process development compared to traditional methods. This accelerates the larger scale and non-murine in vivo studies, preclinical toxicology testing and early chemistry, manufacturing, and controls (CMC) studies necessary to support approval for clinical use. Between 10 ml and 1 liter of nanoparticles can be generated per run, and the system aids process development by enabling the inline dilutions that may be necessary to stabilize some nanoparticle formulations during large-batch production. 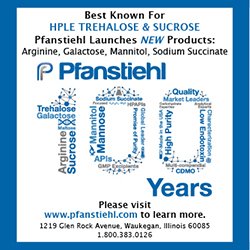 The largest system in the NanoAssemblr family – the Scale-Up system – has been developed specifically for manufacturing clinical-grade materials in the cGMP environment. Designed to be run in a cleanroom and customizable to meet customers’ specific requirements, it offers a completely flexible solution for early stage clinical trial manufacturing through to commercial production. Processes developed on preclinical instruments can be directly transferred to this platform, without any change in the reaction conditions. Using the same microfluidic mixer design as the Benchtop and Blaze systems, multiple mixers are connected in parallel to achieve the desired throughput. For instance, 8 mixers can produce 25 liters of biophysically equivalent formulation in just 4 hours – with the option for further scale-up using more microfluidic mixers if necessary. In addition, the Scale-Up system is available with a completely disposable fluid path – from the pump head to the cartridge – completely eliminating the risk of cross-contamination and providing a ‘blank slate’ for each drug formulation. All the platforms are fully automated, and operated using software designed specifically to ensure ease of use and precise control of particle synthesis. This minimizes inter-operator variability and, for multi-site projects, helps to ensure standardization between partner laboratories. 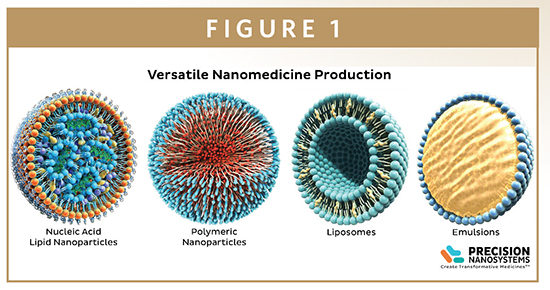 The versatility of the NanoAssemblr technology means that it can also be applied to a variety of nanoparticle systems – liposomes, lipid nanoparticles, polymer particles, and micelles – offering research and development scientists the flexibility to explore a wide range of drug delivery mechanisms. One of the biggest advantages of this approach is that the structure and behavior of the resulting nanoparticles can be predicted according to the processing parameters and particle composition. Data generated by Precision NanoSystems (available upon request) illustrates that processing parameters or particle compositions can be fine-tuned to achieve the desired particles, enabling a more structured approach to nanomedicine research. And because the final product is available in just a few minutes, instead of several hours using conventional techniques, this helps to accelerate development timelines. For example, 40 or more different lipid nanoparticle formulations can be produced in just 1 day, with the reproducibility of the system enabling processing or chemistry parameters to be varied by just 1% to 2% per iteration to ensure a fully optimized product for use as a drug delivery vehicle. One of the most promising areas of nanomedicine is the use of lipid nanoparticles for the intracellular delivery of genetic medicines, such as small interfering RNA (siRNA) and messenger RNA (mRNA). siRNAs are double stranded RNAs, 25-50 base pairs in length, that interfere with the expression of specific genes, and are being trialed in a number of protein knockdown therapeutics. In contrast, mRNA therapies co-opt cellular machinery to produce proteins or peptides to replace defective or down-regulated proteins, or to display peptide antigens that help direct immune responses. In both applications, specially designed lipids are used to completely encapsulate the sensitive nucleic acids within the interior of the lipid nanoparticle interior, with efficiencies approaching 100%. These lipid nanoparticles mimic native low density lipoproteins (LDLs), and are taken up by the endogenous pathway cells use to acquire cholesterol and other lipids needed for their membranes. Following endocytosis, specially designed pH-sensitive lipids trigger endosome disruption and release of the payload into the cytoplasm. Regardless of the application, the implementation of NanoAssemblr technology significantly reduces the time spent making nanoparticles. All four NanoAssemblr instruments have a place on the roadmap from screening to commercial product, with the choice of platform depending on the laboratory’s role and goals. Within the drug development sector, the NanoAssemblr Benchtop is the entry point of choice for many laboratories, as it uses the same microfluidic cartridges as the Blaze and Scale-up. This allows rapid and cost-effective process optimization, while still ensuring seamless technology transfer all the way to clinical trial scale cGMP production. Implementation of this technology helps to ensure that the time-scale between early drug research and a clinical or toxicology study is significantly shortened – by several months or more in most cases – as much less time is needed for process development, with a clear roadmap from early research to end product. The scalability and speed of the NanoAssemblr technology is a major advantage for laboratories across a wide range of sectors, including the pharmaceutical, medical sciences, and biotechnology industries, as well as for laboratories engaged in early stage research and development. By working with the NanoAssemblr platform, researchers can spend their time designing and planning their experiments, solving problems, and asking the big questions, rather than making nanoparticles. 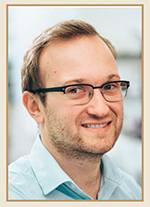 Tim Leaver is the Director of Product Management at Precision NanoSystems Inc. He has been involved with the design, development, and commercialization of the microfluidics and instruments in PNI’s suite of products. He has been involved in developing microfluidic technologies for 10 years, initially as a Research Engineer at the University of British Columbia, where he worked with teams developing single-cell genomics tools. He earned his Bachelor’s of Applied Science in Engineering Physics from the University of British Columbia.